which a boy’s foot was severed in an escalator. girls’ near – drowning at an apartment complex swimming pool. Cord injuries resulted from a rear seat lap belt. vision loss. The settlement includes periodic payments. struck by a van as she worked at a roadside construction site. traumatic brain injury. ATV was defectively designed. “Most liability lawyers simply guide accident victims through the courts. Joseph Romano is a liability lawyer with a modern – day twist: He also guides his clients through the mazes of managed care”. Joseph Romano is a nationally known attorney/advocate whose practice is limited to the representation of children and adults with spinal cord injuries, traumatic brain injuries, amputations, burns, Cerebral Palsy, and other serious/catastrophic injuries. In addition, Mr. Romano focuses his practice on pursuing liability claims and assisting trauma patients with discharge planning and identifying and securing “private funding” from third party private companies. This funding pays for needed supports and services and allows a family to care for their loved one at home during the time it takes to settle or try their case. 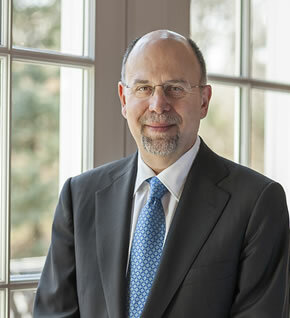 He has received awards and commendations from the American Trauma Society, The Brain Injury Association of America, The American Spinal Cord Injury Association, Phoenix Society (burns), Cerebral Palsy organizations and he was elected to the Pennsylvania Association of the National Head Injury Foundation Hall of Fame. In 1996, Mr. Romano was selected as the only attorney along with medical experts in the field of traumatic brain and spinal cord injury to write a chapter in the medical treatiste Neurotrauma. His chapter is entitled Medico-Legal Aspects of Head and Spinal Injury. Since 1988 he has published over 300 articles and six editions of the Legal Rights of the Catastrophically Ill and Injured: A Family Guide. Mr. Romano has recovered in excess of five hundred million dollars ($500,000,000) for his clients who have suffered traumatic injuries. Verdict against the Philadelphia mass transit agency in a case in which a boy’s foot was severed in an escalator. SEPTA was also fined for concealing documents. Verdict in a hospital error case that left a young man severely brain damaged. The award set a Pennsylvania record at the time for a medical malpractice. Settlement in auto accident case in which severe SCI injuries resulted from a rear seat lap belt. Jury verdict in a premises liability case involving a 3-year old girls’ near – drowning at an apartment complex swimming pool. Jury verdict for a child born with severe brain injuries. Verdict was a record in Erie County, Pennsylvania personal injury case. Settlement: Teenage boy who underwent routine surgery for sports injury suffers anoxic brain injury. Verdict for a patient who was assaulted while in the hospital suffering severe injuries. Record Delaware verdict. Pennsylvania verdict for a woman left incapacitated after being struck by a van as she worked at a roadside construction site. Settlement for a young man who suffered a traumatic brain injury by a defective product. Verdict against the VA Hospital for former Marine who suffered a stroke during a dental procedure. The verdict includes periodic payments. Settlement for a woman who suffered serious injuries when her arm was pulled into a machine that was defectively designed. The settlement includes periodic payments. Settlement for a man who struck an electrical powerline and suffered extensive burns and amputations. The settlement includes periodic payments. Settlement with the Philadelphia housing authority and property manager for girl who suffered brain damage after an asthma attack caused by mold in home. Worker fell at a construction site due to the negligence of a subcontractor and suffered a traumatic brain injury and partial vision loss. The settlement includes periodic payments. Catastrophic injuries when minor child fell through a window screen in an apartment complex. The window screen did not have window locks. Settlement for a young man who suffered a traumatic brain injury after being struck by a truck. Bicyclist suffered traumatic brain injury because of defective road conditions. The settlement includes periodic payments. Settlement for a man who suffered traumatic burns after a boiler exploded because it was defectively designed. The settlement includes periodic payments. Settlement for a young man who suffered extensive limb loss from negligent medical care. Settlement in an ATV rollover accident which caused permanent traumatic brain injury. ATV was defectively designed. Settlement for a worker who was wearing flame retardant work clothes that caught on fire. He suffered extensive burns. The settlement includes periodic payments. Settlement for a man who sustained a closed head injury because defectively designed helmet. Settlement for a minor who suffered a spinal cord injury because of negligent supervision at a gymnastic class. The Law Office of Joseph L. Romano works on a contingent fee basis – which means we only get paid if and when you are financially compensated. The Law Office of Joseph L. Romano is paid a percentage of the amount recovered. Any cost incurred by the Law Office of Joseph L. Romano will only be charged if the client is financially compensated. Mr. Romano along with qualified co-counsel represents clients throughout the United States. The gift that Joe had was that he knew my rights…I would never have known what to do, especially in my condition. My son suffered a catastrophic near drowning injury. I knew from the initial meeting with Mr. Romano that he had the experience and knowledge to get the best outcome for my son. He went above and beyond by helping me navigate the health care and governmental systems to maximize benefits for my son while the case was in litigation. The resolution of the lawsuit was more than I could have ever expected! If you have questions or would like more information call (800) 331-4134 or email info@josephromanolaw.com. Families need to fight for all of the benefits and services that their loved one is entitled to, and use Private Funding to supplement their existing health insurance and governmental benefits. Language interpretation service available upon request. Who referred you to the Law Office of Joseph L. Romano? 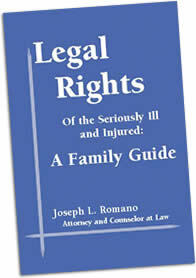 If you have questions or if you would like to receive a FREE copy of Joseph Romano’s book “Legal Rights of the Seriously Ill and Injured: A Family Guide” please call (800) 331-4134 or email info@josephromanolaw.com. © 2018 Joseph L. Romano Law. All rights reserved.